We seem to be moving toward an IT-centric industry. How would you assess where we are now? I can summarise it by a quote an Italian friend of mine gave me, talking about the political situation in Italy. He said, “The trouble is, the system of disorder is breaking down.” The remarkable thing now is the pace of change. There has always been change in broadcast, but now it’s being overwhelmed by the pace of IT change. I was thinking about it in terms of my mobile phone resolutions over the last decade. Ten years ago, I was running what could be described as one quarter VHS quality, then a couple years later we were up to VHS resolution, then standard definition, then 1080p HD, and now I own something that shoots 30 frames a second at 4K. Of course, people in broadcast say, “Well, it’s a rubbish lens, it can’t compete.“ But in post production we are moving more and more to using standard IT equipment, for logging and editing particularly. Our FORScene clients use a standard PC, they use standard internet connection and Ethernet cables connected to standard disk drives. A huge amount of post production technology runs on standard IT equipment. Of course there are bits that aren’t standard equipment, like your Grade 1 monitors and your dedicated kit for finishing, but there are elements that are standard IT equipment. And the pace of IT change is phenomenal. And what do you think the next changes will be? The next change taking place, is replacing the computers and the storage and the networking with cloud, which is an entirely IT-based change. There’s no broadcast equipment involved there. That means now we’re fully in the world of the pace of IT change. And the cloud is best for IT and post production is largely IT-based. I can plug my monitor and do my post production in the cloud just as easily as if it’s on my local network. Whether everything is happening in the cloud or on my local machine, I don’t really know. It could be using resources from anywhere. 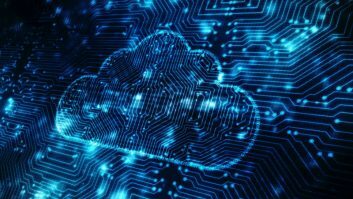 Are there still issues that need to be addressed before broadcasters can fully adopt cloud production? There are a couple of issues, and it’s the same sorts of issues that people have previously had with IT. And that ultimately has to do with who the equipment is designed for and reliability. We did the Olympics for YouTube, and they asked us if we could use the Amazon cloud as a backup, which we did. Then a week before the Olympics, the Amazon cloud went down and loads of websites went offline. NBC had spent $1.2 billion on their summer Olympics rights. We have our own cloud, which doesn’t have any issues that you could have in a public cloud – it’s reliable and responsive. But can you imagine if NBC lost four days of that, they wouldn’t be very happy. Most of these clouds are designed for the world at large, rather than for broadcast. They’re not really designed for mission critical things. And people who use them will have to adjust their workflows to allow for possible problems or interruptions. This is where FORScene has a big advantage, because we’ve designed our cloud specifically for broadcast. With FORScene, we have a very client-based processing model. The cloud’s always working for you locally, so when you click a button, the cloud responds immediately. It guesses what you might want to do, so it’s got a number of different possibilities all lined up, and whatever you do, whatever button you push, you’ll get an immediate response. And when you try to save something in the cloud, you don’t have to wait for it to actually save before you carry on working. How will companies have to adapt to the changing landscape? The cloud is OPEX space rather than CAPEX. That means that if you’re not happy with the responsiveness of your cloud, you can just switch providers. I think what’s going to happen is that the clouds that don’t fulfill their purposes will just not be used. But in the short term there will be an explosion of cloud applications that make use of this almost-free resource before people realise that they don’t really work. As you know, FORScene uses the internet. When you look at what our competitors are saying about the internet, they’re saying it’s not reliable for professional use, that you have to have a network, you need fibre optic cable and fast connections to make sure their server-based solutions deliver you a reliable workflow. What we’ve done in FORScene is spent 10 years making it work for an unreliable network. And I think with the cloud it’s going to be the same issue. There will be a big difference between using something off the shelf as a general IT solution and using something which is going to work reliably. And that will be beyond most of the cloud providers. There’s no technical reason that you can’t do everything in the cloud. But the cloud goes much further than post production – you can use it for pre-production too. In FORScene, you can upload PDFs of scripts, your casting videos and other material. With disks halving in price every year and the internet doubling in speed every year, it’s only a question of time before broadcast customers start thinking they will do finishing in FORscene. So we’ve been adding more and more higher editing features. Vendors can’t rely on hardware anymore. In broadcast, you can’t make money on the hardware, you have to make it on the service you provide. So the business models of a lot of companies will change.